At a riverfront event on September 8, Grand Rapids Whitewater released findings of the Economic Benefits of the Grand Rapids Whitewater Project, a study focused on the potential for expanded economic activity directly related to the restoration of a 2.2-mile stretch of the Grand River through downtown Grand Rapids. 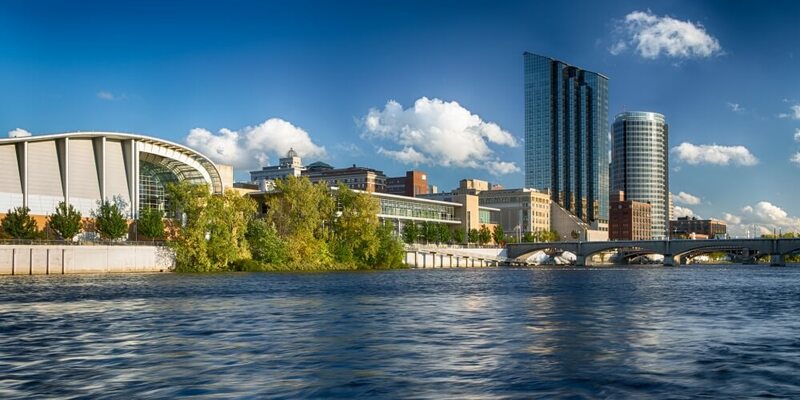 The study, conducted by Anderson Economic Group and commissioned by Grand Rapids Whitewater, estimates that expanded recreational use of the river and riverfront will stimulate net new economic impact of $15.9 million to $19.1 million per year. This estimate takes into consideration new and enhanced tourism associated with recreational activity such as kayaking, fishing, rafting, stand-up paddling, wading and other forms of water and riverfront recreation. The estimate comprises net new visitor spending and new earnings for the Grand Rapids workforce. Grand Rapids Mayor George Heartwell, GVSU Economics Department Chair Dr. Paul Isely, Gov. Snyder’s Special Advisor for City Placemaking Rodney Stokes, and Healing Our Waters-Great Lakes Coalition Campaign Chair Todd Ambs joined GRWW Co-founder Chris Muller for the announcement to project partners, funders, business and community leaders and the media. Chris Muller explained that, after being awarded the Urban Waters Federal Partnership and releasing the preliminary restoration plan last fall, commissioning the AEG study was the natural next step in moving this project forward. GRWW needed to demonstrate the viability of this project to our partners, members of the community, and funders. This report does that and lays the groundwork for additional economic impact studies the City is conducting in conjunction with the broader Downtown Plan and River Corridor Plan, which will focus on development on the banks of the river corridor. Read the press release and the full report for more about the anticipated economic impact of the Grand Rapids Whitewater project.